After a strange immigration experience at the Queenstown Airport, one that involved my girlfriend and I being interrogated in separate rooms about our online businesses, our 8-day New Zealand road trip finally began. Yes, New Zealand would prove to be spectacular, so much so that it far exceeded every expectation, every single day. If the country, at least the south island as that was all we had time for, is not the most beautiful location on this planet, it is definitely as close to the top of that list as it gets. And while 8 days is not sufficient time to thoroughly cover every corner of the south island of New Zealand, it is sufficient time to get a taste of what it offers, and to have an absolute ton of fun doing so. Drive to Te Anau – driving south along State Highway 6, it took us 3.5 hours to reach the town of Te Anau, the gateway to the Fjordland National Park; naturally, we found an infinite number of places to pull over along the way as the views really never get old! Did I mention this will be a long day? Long but oh so worth it! Accommodation: Oasis Yurt Lodge – awesome, comfortable yurts in a quiet, beautiful location just outside of town; definitely the best place we stayed at and well worth checking out! Glow worms – once darkness fell, it was time to go searching for glow worms! ; at the south end of town, between the fire station and the St. James Historic Church, there’s a walking trail on the east side of the main road; we walked right in, let our eyes adjust and started looking into the trees until we spotted glow worms; in the end, we saw thousands and it was far more impressive than we imagined! Yes, it was a little rushed. We could easily have spent 2 or 3 or even 4 weeks on the south island alone. But we did what we could with the time we had and, without a doubt, we absolutely loved every day of our stay. I don’t think I’ve ever been as in awe of my surroundings as I was during this trip. And to be honest, no matter where you end up going in this remarkable country, it’s hard not to have the same reaction. Whichever route, activities and sights you choose, you shall be rewarded. You’ll see what I’m talking about! MILFORD SOUND CRUISE: There are at least 6 companies running these cruises and they all have great reviews. I would go with the one that offers the best deal for the day you’ll be there. With a little research you can easily find heavily discounted tickets, even on the official websites for the cruise companies. (We paid $90 USD total for 2 people with light lunch included.) I would avoid going in the mid or late afternoon as there is a higher chance that heavy cloud cover arrives and your visibility will be greatly reduced. COSTS: New Zealand is indeed an expensive country but there are ways to keep your costs down. Accommodation and food are pricey, but you can also stay in hostels, guesthouses or campsites and you can always cook your own food to save money. Every place we stayed at had a communal kitchen. Also, the good news is that almost all of the places I mention above do not have an entrance fee. While activities such as a Milford Sound cruise and Skyline Queenstown cost money, all of the walks, hikes, views, scenic routes, glaciers, waterfalls and other stops we made every day didn’t cost anything. Any questions about taking a New Zealand road trip? Any input to share from your own experiences? The post 8-Day New Zealand Road Trip (Detailed Itinerary) appeared first on Wandering Earl. A melting pot of cultures in a picture-perfect setting, Singapore has it all. Situated beside Malaysia, it has become one of the most visited cities in the world, and it’s easy to see why! With exciting attractions, some of best food in the world and a one-of-a-kind culture, Singapore is an Asian destination that you just can’t miss. Most travelers choose to spend a few days exploring the city during a stopover, since the Changi Airport is a big hub for destinations throughout Asia. Whether you have a few hours, or are trying to explore Singapore in 3 days, you can build an awesome itinerary and hit all the top things to do. Want to maximize your time here? Check out my itinerary for 3 days in Singapore. Singapore is a small country, and it’s easy to get around thanks to its well-connected network of transportation. The Mass Rapid Transit (MRT) is a simple and affordable way of getting wherever you want to go. If you’re trying to see as much as possible in a short time, the Singapore Tourist Pass is a great deal and will give you limited rides on any type of public transport. A one-day pass costs $10 SGD ($7.50 USD), a two-day pass costs $16 SGD ($12 USD) or you can get a three-day pass for $20 SGD ($15 USD). Before you go, be sure to download the Grab app! Uber is disappearing here, and taxis can get pricey — especially at night. The Grab app works just like Uber and is an excellent alternative to the MRT. Start your day at the Gardens by the Bay! You will want to get there right at 9 a.m. to get ahead of the crowds. I was absolutely mesmerized by the Supertree Grove, Flower Dome and Cloud Forest. I’d recommend giving yourself at least two hours to take it all in. I opted to a spend a night at Marina Bay Sands, but you don’t have to have a room at the hotel to take in the view from this iconic spot. Head over to Marina Bay Sands and get a ticket for the SkyPark Observation Deck. The panoramic views of the cityscape from the 57th floor here are unreal. Bring your camera and spend some time wandering around the markets of Chinatown before making your way over to Buddha’s Tooth Relic Temple. Once you have worked up an appetite, go for lunch at Chinatown’s Maxwell Hawker Centre. There are so many incredible local dishes that it’s impossible to narrow it down to a fave, but some of the best Singaporean food includes chili crab, prawn mee (a noodle soup with prawns shown below!) and laksa (a spicy noodle soup). Also, the Tian Tian Hainanese Chicken Rice stand in the food court is a local institution! The Bugis Street Market was once a red-light district famous around the world, and now it’s famous with tourists and locals alike as the largest and cheapest place to shop in Singapore. If you’re on the hunt for souvenirs or just love wandering foreign markets, this is a must. Another local icon, you have to get on the Singapore Flyer for your first sunset in the city. While it is undoubtedly touristy, it is worth it to take a thirty-minute ride one of the world’s most enormous Giant Observation Wheels. This buzzing neighborhood along the river is where Singaporeans and travelers in the know go when the sun sets. Come here for dinner then stick around to explore the countless bars and clubs. Get an early start on day two at the Tiong Bahru Market. Opening at 6 a.m., this is a local market with all kinds of fresh seafood, fruits and veggies. For hungry travelers, it’s all about the hawker food stalls. Eat your way through the market then hit the streets ready to take on another day in Singapore! This 158-year-old property is the only tropical garden to be honored as a UNESCO World Heritage Site. Be sure to check out the orchid gardens! While they call it Arab Street, this famous neighborhood actually extends through Bussorah Street, Haji and Bali Lanes and Muscat Street. It’s full of shops, cafés, restaurants and photo opportunities. Just be sure to avoid the area on Sundays as most places are closed. An iconic cultural landmark in Singapore, this museum combines art, science, culture and technology. Check out the impressive exhibitions filled with beautiful displays of lights and sculptures. There are lots of different experiences to be had here, so be sure to check out their website for more info. If you love seafood as much as I do, Jumbo Seafood’s flagship restaurant in the East Coast Seafood Centre is a must. Their award-winning Chili Crab has a cult following in Singapore! I also had an amazing dinner at Po Restaurant at The Warehouse Hotel, that I’d recommend — they have a great lineup of craft cocktails too! This prominent mosque is one of the cities’ most impressive religious buildings. You can take a guided tour to learn more about the history of the mosque or just take a quick look around on your own. Get back to the Gardens by the Bay for their magical nighttime Garden Rhapsody Show. It’s usually on at 7:45 p.m. and 8:45 p.m. every night, but double check their site for a current schedule before you go. Singapore is all about rooftop bars! In the heart of the city, I stumbled onto Smoke & Mirrors, a cool cocktail bar with a view that’s well worth checking out. I also stayed a night at Marina Bay Sands, which boasts an epic rooftop infinity pool and bar! Sentosa Island is where Singaporeans and people from around the world head to have a frolick in the sun and sand. This island resort has beautiful beaches, spas, outdoor activities and theme parks like Universal Studios. Have more than three days in Singapore? Lucky you! While Singapore is a small country, you could easily spend a week exploring it all. Joo Chiat is another historic neighborhood that I adored! The Peranakan’s colorful houses are so cute and picturesque, so be sure to plan for plenty of time there to snap photos. Back along the river, Boat Quay and Roberstons Quay are top hangouts. You can spend hours exploring the area, which boasts an eclectic mix of alfresco dining, art houses, bazaar shopping and much more. Last but certainly not least, just keep eating your way through the city! Another spot I loved was Neon Pigeon. It’s a hip restaurant that offers delicious Asian fusion cuisine. Shop my Singapore style essentials! The post Itinerary for Singapore in 3 Days appeared first on The Blonde Abroad. Have you ever been somewhere so unreal and beautiful, that after the trip was over you wondered if it was all a dream? If we didn’t have the photographic evidence of me and Tim being whisked away to a remote private island in a helicopter, or the video of a giant Alabra tortoise chasing me down for my iPhone that he thought was starfruit, or the pictures of floating in the clearest water we’ve ever seen, we just might have thought it truly was all a dream. This is Fregate Island Private. Seeing as only a measly 2% of the Seychelles foreign visitors are Americans each year, we’d be willing to bet you couldn’t find the Seychelles on a map. Or you might not have even known it’s a country. And that’s okay – I’ll let you in on a secret; we probably hadn’t heard of this island nation either until we visited the Maldives back in 2012. After all, Seychelles – as this Indian Ocean island nation is now called – is a relatively new country. It was only discovered 300 years ago. Pirates were the first inhabitants in the 17th century and then it changed hands between the French and British up until Seychelles gained its independence and officially became its own independent nation in 1976. Seychelles sits about 1000 miles off the coast of Kenya and northeast of Madagascar, about 4° south of the Equator. It’s made up of 115 islands, one of which is Fregate Island. 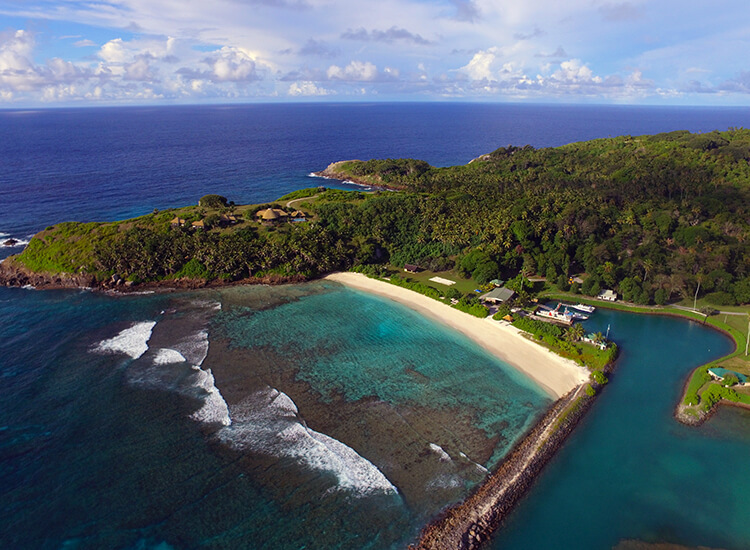 Located 35 miles and just a 20-minute helicopter flight from the Seychelles’ capital, Fregate Island is the most remote of the Seychelles Granitic Inner Islands. The island was named for the abundance of frigate birds found there on an expedition by French explorer Lazare Picault in 1744. When French explorers landed in Seychelles in the 18th century, they found a positively primitive group of islands inhabited by prehistoric trees, exotic birds and giant tortoises that would shrink back in to their shells. If there was a true eden on Earth, Seychelles was it. Seychelles are the only mid-ocean granitic islands on Earth. Once part of Gondwanaland, the islands are the scraps that broke off and continued to drift when India broke off the super continent. That’s basically a fancy way of saying that Seychelles are truly unique with a plethora of flora and fauna found no where else on Earth. Up until the 1970s, the primary economy of Seychelles was plantations and more than a third of the island’s population was employed by plantations. The first colonists, the French and their slaves, grew spices like cinnamon, chili peppers and cloves. Cotton and sugarcane would follow, then eventually coconut plantations even later. The indigenous flora were either cut down or choked out by invasive species to create the plantations. Three hundred years of human settlement has taken its course on these islands, and some species have gone extinct while others are in perilous danger of doing so. With the opening of the international airport on Mahé in 1972, Seychelles main economy began to change from plantations to tourism. And in the case of Fregate Private Island, tourism is a very good thing. Opened as a passion project as a way to fund the conservation and restoration of Fregate’s native habitat, Fregate Island Private is otherwise uninhabited aside from the resort with 16 luxury villas that can accommodate an exclusive 79 guests. The island is basically self-sustaining. 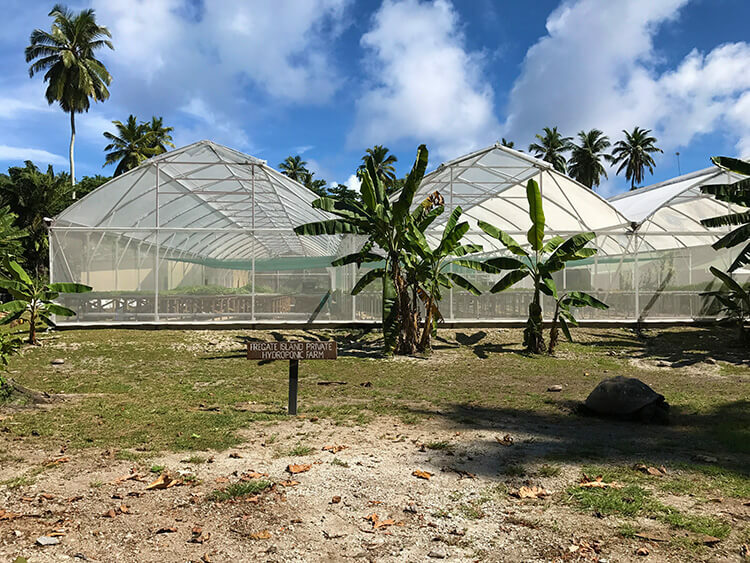 The two restaurants are supplied with the fresh catch, native fruits and spices that grow on Fregate and more than 50 other types of fruits and veggies that are grown in the island’s greenhouses – the excess is even sold to other hotels on the main islands. There’s a water plant and generators for electricity. A medical clinic serves the 150 staff that call the island home, along with any guests that may need it during their stay. A helipad and a dirt runway serve the Fregate Airport, and there’s a harbor where boats are controlled to ensure Fregate remains pest free. 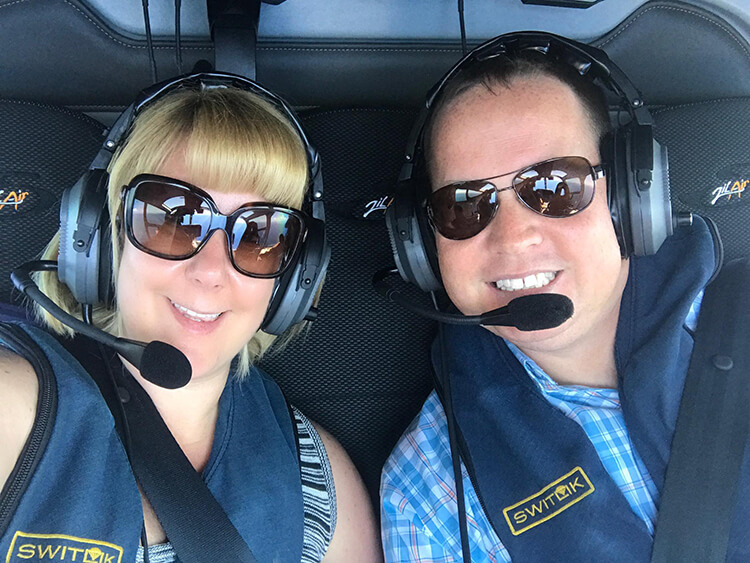 As the helicopter gently sets down on the helipad, a team of staff including your personal butler is already waving and waiting with refreshing towels and cool drinks. And before you know it, you’re being whisked off in the golf cart that will be your vehicle for getting around Fregate Island to your villa. There are 16 villas all spaced far enough apart that you feel like you’re on an island all your own. In fact, aside from when we went to the restaurant for breakfast or dinner, we actually never saw the other guests despite all the villas being full. Once you step foot in your private pool villa, you start to understand why. It’s a place you don’t want, or even need to leave. A central indoor dining and entry separates the two main areas of the one bedroom private pool residences, which can accommodate two adults and two children. Our villa was tucked in to the lush jungle, with views from the sliding glass walls and terrace of the azure ocean and other islands like Praslin and La Digue dotting the horizon. On one side, the bedroom with king size bed draped in mosquito netting sits in front of a bathroom with separate toilet room, huge double sink vanity, a bath big enough for two, indoor walk-in shower and an outdoor shower that leads right in to the indoor shower. There’s a tv with 150 channels, though we never even turned a tv on while at Fregate Island Private. The cozy living room sits on the other side of the house, with another small bathroom and outdoor shower. The mini bar is fully stocked with sodas, water, beer and rums made locally at the Takamaka Rum Distilleryon Mahé. Mix up some rum cocktails, or take the bottles of white and coco rum home – they’re your gift. And for the wine lovers, there’s a dual climate controlled wine fridge stocked with wine from France, Italy, Argentina and South Africa. Snacks like cookies, brownies and wasabi nuts are restocked daily. Plus, there’s a Nespresso and tea making supplies. The massive terrace has the largest personal infinity pool we’ve ever had, and we’ve stayed at quite a few private pool villas around the world. A separate jacuzzi, which can be enjoyed hot or pool temperature sits at the edge of the infinity pool. An outdoor daybed sits like a perch over the swaying coconut palms on one side, and an outdoor dining gazebo on the other. Each guest also receives a flashlight, which definitely comes in handy for walking down the steps to the restaurant at night. 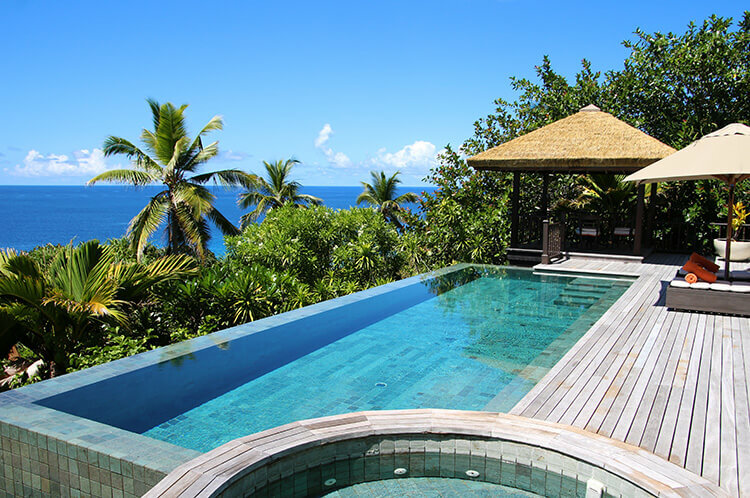 On Fregate Island Private, there’s no need for villa keys and you won’t receive one. Though the sliding glass doors all do lock if you feel more comfortable locking yourself in at night. There is a safe in the villa for securing any valuables that you like. But the only intruders you’ll experience are the occasional giant millipede (also an endangered species, but totally harmless) that worms his way in through the thatched Balinese roofs or the geckos. Your villa comes with your own buggy to get around the island. We appreciated that a magical buggy fairy seemed to appear everywhere to turn the buggy around so that we never had to back out, plug it in to charge it up and leave cold bottles of water and fresh flowers in the cup holders. We’ve stayed on a number of private islands now, and there isn’t honestly a lot to do beyond beach, diving or snorkeling and water sports like kayaking or stand-up paddle boarding. That couldn’t be farther from the case on Fregate Island Private. We stayed four days and left wishing we had more time. Between diving and all the on land activities, we kept ourselves quite busy and still didn’t manage to do it all. Fregate Island is without-a-doubt one of the most beautiful places we’ve ever been. But as gorgeous as the beaches are, it was the thousands of Giant Aldabra Tortoises that roam freely about the island that stole our hearts. They’re everywhere, even having to be chased off the the grass runway when small planes land. They come in every size from ones small enough you could probably pick them up to the 150 year old giants easily standing 3-feet tall. Most comically pull their heads and limbs in to their shell at even the sight of you that you can’t help but smile. Many show their displeasure at your presence with a hiss like an angry cat. Others just couldn’t care less that you’re there and continue ambling on by, munching on the grass or even getting busy with the lady tortoises. He does disappear on walkabouts, sometimes up to a month at a time. James was probably on one of his walkabouts, because we didn’t get to meet him during our four days on Fregate. But he also has some friendly friends that are more than happy to let you give them a pat on the head. We’re not sure of the name of the old fella we met, but he certainly loved starfruit. After he ate three of four, he was convinced my gold iPhone was a piece of starfruit I was holding out on feeding him. A hilariously slow-motion pursuit ensued, giving me the opportunity to pose for a re-enactment of the National Geographic video of a mad mating Giant Aldabra Tortoise chasing the photographer in the slowest pursuit ever. One of our favorite on land activities, which I admittedly did a bit of moaning and groaning about, was a sunset hike up to Fregate Island’s high point. Mount Signal sits at 410 feet and is perfectly positioned for watching the sun kiss the sea. If you drive your buggy to the trail head, it’s only a 20 minute walk gently sloping upward. Though you’ll definitely want proper shoes as the rocks are uneven and not suitable for flip-flops. Our butler schlepped a picnic basket and cooler up there, so we could enjoy icy-cold Seychelles beer and a picnic with sushi, tomato and mozzarella skewers, salmon on cucumbers, prosciutto wrapped melon and hand cut savory banana chips. From this side, none of the resort is within view. Mahé, on a clear evening, looms on the horizon and the waves crash into the stretch of powdery white sand below. The orange-headed fruit bats flap their massive wings and as the giant tortoises that find their way even all the way up here rustle in the bush, it feels like you’re in a scene in Jurassic Park. Tree houses aren’t just for kids. At least, not at Fregate Island Private. A tree house sits among the tangled branches of one of the island’s oldest and largest banyan trees. Here the only sounds are the jungle birds chirping, like the fairy terns, and the occasional plonk of a coconut falling from a palm. Your butler brings an entire meal of whatever you’ve ordered and raises it up in to the tree house with a dumbwaiter. Oddly, in a tree house surrounded by birds is one of the few places where the birds don’t start to get bold while not-so-patiently waiting for you to share a bit of whatever you have to eat. Instead, we sat peacefully watching as mother fairy terns returned to feed their fuzzy chicks that hadn’t yet learned to fly fish. The air even feels different in the tree house. Cooler. Supposedly the banyan trees give off so much oxygen that they do create a noticeable temperature change around them. You can dine just about anywhere on Fregate Island Private, and a popular experience is a candle and torch lit dinner on the beach. Ours was planned for the one night that we had a bit of storm, so it was set up for us at the Yacht Club just next to the Marina Beach. Candles in bamboo, an invasive species that has to be chopped, lit the pathway leading to just one candlelit table for us to dine under the stars. A private chef grilled surf and turf right there, the shellfish and fish all freshly caught earlier that day, as we sipped a rosé from South Africa and dined on hearts of palm salad. Your butler can even arrange a fishing excursion and the chef will prepare your very own catch, if you like. Fregate Island Private is surrounded by a reef and there are at least nine different dive sites all within 15 minutes of Fregate’s marina. The dive center, a world-class PADI center that also offers certifications, only takes divers out in small groups of two at a time. Like at Deep Water Cay and Two Seasons Coron Island, we headed out on a very comfortable dive boat and as still fairly new divers, continued to get attention from the dive master that help us improve our skill levels. We planned to dive a site at Little Fregate, a small island off the west side of Fregate, though the water was too choppy on that side from a storm that had blown through. Instead, we dove the reef directly in front of Anse Bambous and La Cour Beach. Seychelles has some of the top named dive sites in the world, though you should realize that Seychelles experienced severe coral bleaching in 1998 from El Niño leaving 97% of some areas bleached. The reefs had started to make a comeback, though since 2016 the islands and the reefs are in jeopardy again from just as severe bleaching. Despite these bleaching events, the reef and other underwater granite rocks are teeming with sea life. In fact, the underwater world has more fish of all kinds than we’ve seen diving or snorkeling anywhere yet. Hawksbill sea turtles seemed unbothered by us as they swam alongside us. Fregate was once left nearly stripped of its native trees during the plantation era and the island’s Giant Aldabra Tortoise population dwindled to just 150 from loss of habitat and human intervention. With the re-introduction of native trees and the help of Fregate’s ecologists, the population has grown from 150 to over 2200 in just 25 years. The tortoises freely roam and mate. Though the tortoises are extremely protected from poachers and have no predators on Fregate, the babies still are very vunerable. As babies, their shells are very soft and birds can be predators since they can break apart the shell with their beaks and eat the tortoise. Thankfully, Fregate is rodent free unlike the Galapagos, where rats attacking the babies and eating the eggs before they even have a chance to hatch endangers the repopulation of the Galapagos Giant Tortoise. But they face other dangers as young tortoises in the wild, like flipping on their backs and not be able to turn themselves back over. Ecologists and staff bring babies found on Fregate to the Baby Tortoise Nursery, where they can get all the proper nutrition to grow into big, strong adults and be protected from dangers they face. You can adopt a giant baby tortoise, name it, mark its shell for tracking purposes and come back maybe a year or two later to look for the released tortoise in the forest. We just didn’t have time for a nature walk with the ecologists with so many other activities available to do on the island, though our butler ensured we saw as many of Fregate’s species as we could find. The island is a true bird lover’s paradise and you can spot the rare Seychelles Magpie Robin, brought back from the brink of extinction. Thirty years ago, only 14 remained making it the second rarest bird in the world. 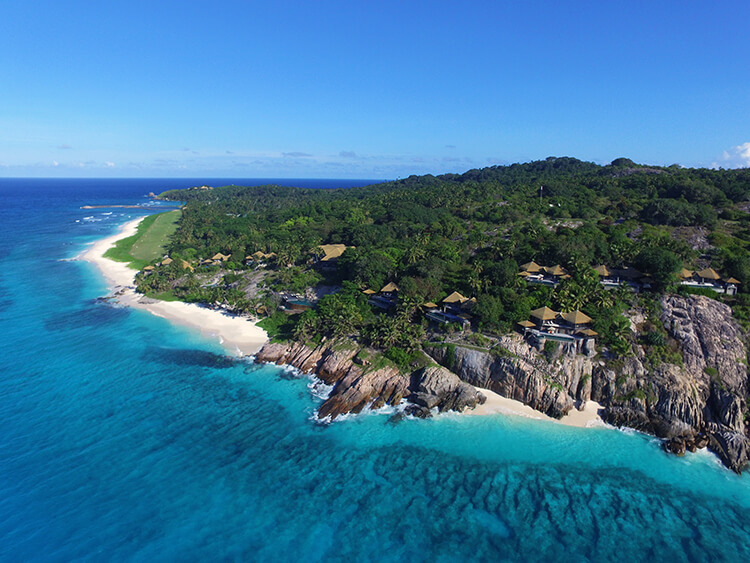 Like the Giant Aldabra Tortoise, the team at Fregate has worked to repopulate the species and today around 150 are thriving on Fregate and four other Seychelles islands. 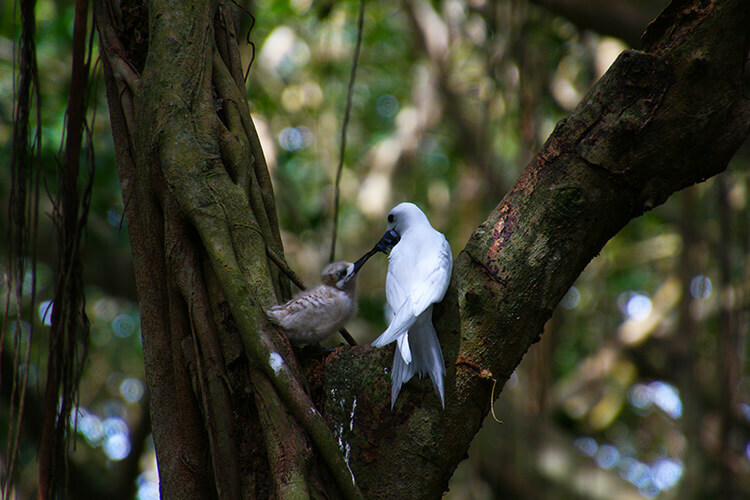 Beautiful white Seychelles Fairy Terns fly back and forth from the forest to the water, catching fish for their chicks. They don’t build nests, instead laying just one egg on various branches. The chicks will stay on the branch once they hatch waiting for their mom to bring them fish until they learn to fly. The Seychelles fruit bat is abundant throughout the Seychelles and there are a few trees in particular where large populations take up residence on Fregate. Being on an island with just a smattering of buildings, there’s essentially no light pollution. Fregate is one of the most beautiful places we’ve been for stargazing and there are programs available for aspiring astronomers or night-sky nerds like us. One of the world’s top luxury private island resorts wouldn’t be complete without a spa and all guests receive a 1-hour massage complimentary. The spa uses all local Seychelles products made with the abundance of local plants known for their healing and rejuvenating powers. You’re also welcomed with a refreshing beverage like an iced tea made with the lemongrass found on the islands. A full menu of treatments and services are available, though we only took advantage of our 1-hour full body couples massage. And it was divine. There’s also a yoga instructor in house and yoga sessions are available daily. The spa facility has an air-conditioned gym, and a personal trainer is available for guests who would like one. You simply can’t come to Seychelles and not experience the postcard perfect beaches. 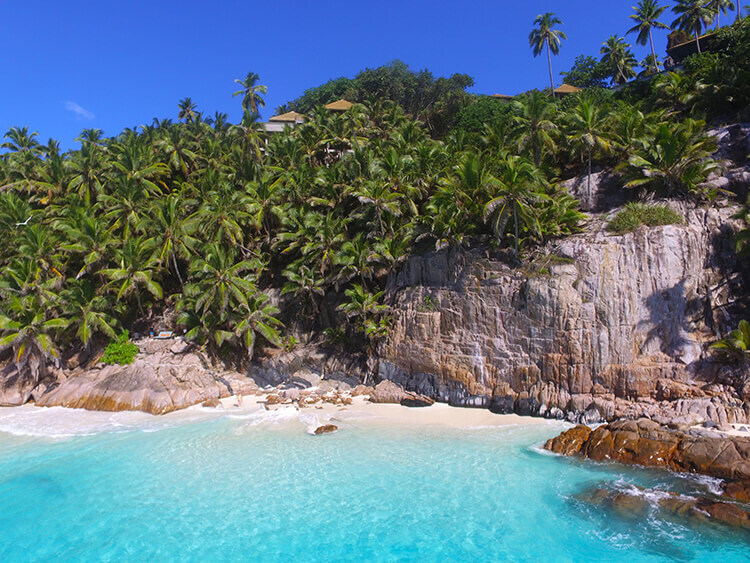 Fregate Island Private’s own Anse Victorin was named the world’s most beautiful beach by the Times UK. Though, we’d say that all seven of Fregate’s beaches are serious contenders for the title. Only one of Fregate’s beaches has a bar and restaurant, though we loved that every beach has a cooler that is stocked daily with ice cold water and soft drinks. There’s also towels available at every beach and your butler can arrange a beach picnic for lunch. Most of the beaches all have a phone to be able to call your butler should you need, and the ones that currently don’t have plans for phones to be installed soon. Once named the world’s most beautiful beach by the Times UK, Anse Victorin sits at the north-western end of the island and is a perfect spot for watching sunset. You reach it from 152 stairs leading down through the forest, so if you do go for sunset you’ll want to bring one of the flashlights for the climb back up. The white beach and coconut palms turn golden as the sun begins its descent in to the sea. Granite boulders, polished smooth from the sea and wind over millions of years, are fragments tossed ashore from the ancient supercontinent Gondwanaland. It stretches nearly a quarter mile and is almost always deserted. Can you spot us and the daybed? Just next door to Anse Victorin, Anse Macquereau is a miniature version perfect for two. Just turn the sign at the top of the 140 steps leading down to “beach in use” and it becomes your very own private beach on Fregate Private Island. A sun bed big enough for two sits on a rock platform just above the beach since the tides can make this beach almost entirely disappear. Stairs lead down from Fregate House to the two resort pools and the main beach, which has a beach bar and restaurant. Here the surf is the most gentle, lapping at the long stretch of sandy beach and you can snorkel directly from the beach on the massive reef. The Pirate’s Bar has a lovely view and is a great place to enjoy an umbrella drink. Anse Bambous and La Cour Beach are technically one long beach spanning almost the entire eastern side of the island. A few of the villas do have stairs leading down to the beach. Grand Anse is one of Fregate’s most wild beaches. It’s on the west side of the island and waves crash on the shore. The beach itself is a mixture of course sand, coral and shells that have been tossed ashore. The five varieties of sea turtles that live in the waters around Fregate often come ashore even during the day and the ecologists keep an eye on the nests they lay here. If you’re lucky, you might even see the hatchlings making their way in to the sea. Grand Anse and the Marina Beach are the only beaches you can drive your buggy all the way to. Anse Parc is a small beach on the south-eastern part of the island that is the most remote of Fregate’s seven beaches. To reach it, you need to follow the walking trails toward Pirate’s Rock and continue down to the beach. You can get a beautiful birds-eye view of it from the viewing platform on the way to the Banyan Hill Estate. The Marina Beach is almost like a natural swimming pool, protected entirely from the waves and current by a rock break. It’s also located right next to the kid’s club, making it the shallow beach a great place for families to play in the ocean. While a stay at Fregate Island Private comes with a hefty price tag that can easily exceed $20,000 for a few days, it’s an entire experience unlike anything else on Earth. Celebrities (Brad Pitt, Jennifer Aniston and Pierce Brosnan have all been guests) and the ultra-wealthy won’t even bat an eye, but if you fall in to the need-to-save-up category then Fregate Island Private is definitely a once-in-a-lifetime experience worth saving up for. Much of the price of the stay actually goes to all the conservation efforts happening on Fregate, so you can also feel good that your holiday is helping endangered species and the environment. Skift Take: Travelers love to hate Spirit Airlines, and considering the way the carrier treated its customers for about a decade, that makes sense. But come next year, Spirit will offer a decent experience to its passengers. Will that help is attract more flyers? Far far away, behind the word mountains, far from the countries Like Japan, USA, India, and all Others, Book Your Vacations With Us.